Aloo gobi, a classic Indian dish of curried potatoes and cauliflower, makes for a wonderfully nourishing stew. Full of veggies, it’ll offset all the holiday baking and sweets we lived on for the past month – it’s exactly the sort of thing we crave when January arrives. As with most curry dishes, it will improve with flavour after a day or two in the fridge, so it’s perfect for making on the weekend if you anticipate a busy week. 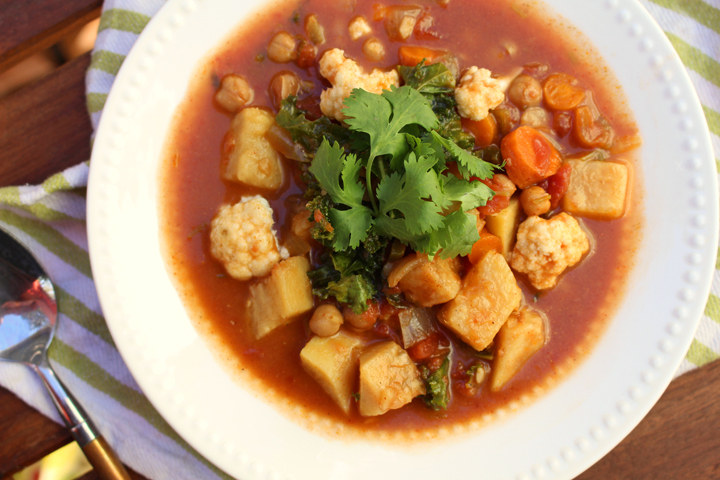 This stew is apparently one of Eddie Vedder‘s favourites – all the more reason to give it a try! Heat a drizzle of oil in a large pot set over medium-high heat. Add the onions and saute for 4-5 minutes, until soft; add the garlic, curry and cilantro and cook for another minute or two. Add the remaining ingredients (except the kale and cilantro) and simmer until everything is tender. (Alternatively, toss it all in a crockpot and cook on low for 6-8 hours.) Add the kale at the end and simmer just until it wilts. Remove the cinnamon stick and serve topped with fresh cilantro. Posted in Recipes, Soups, Salads & Dressings and tagged Stew, soup.